It’s time to upgrade your tools. 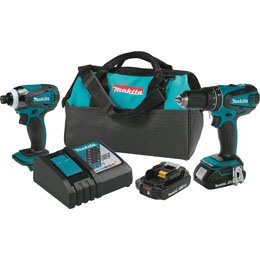 But how do you decide between these two cordless drill and driver kits from Makita? There is a key difference that may make your choice a lot easier. Let’s take a closer look at both to help you decide. 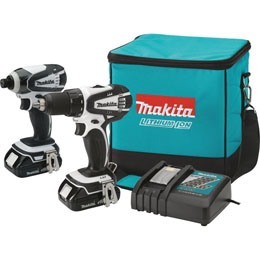 The Makita XT273R kit contains the XPH01Z hammer drill, the XDT04Z impact driver, a charger, and two 18V batteries. You can store all this in the included soft contractor bag. What are the highlights of this drill and driver kit? There are many great features that pros love. For example, both power tools are very durable, designed for years of use. They have XPT protection against moisture and dust, plus Star Protection Computer Controls against overheating, overloading, and over-discharging. Both tools are lightweight for the amount of power they have. To illustrate, the ½-inch hammer drill weighs just 3.4 pounds with its battery installed. But its two-speed transmission works at speeds up to 1500rpm, while the four-pole motor has 480 inch-pounds of torque. With the XPH01Z hammer drill, you can sink screws into hardwoods, metals, and masonry. And the LED work light mounted underneath the chuck will help you see exactly where to make the next hole. Meanwhile, the impact driver is even smaller. 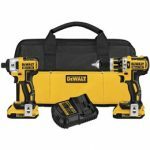 It’s only 2.8 pounds with the battery, but it has 1420 inch-pounds of torque for tough fastening jobs. Your wrist will thank you for using such a well-balanced and light tool! Plus, the compact shape and built-in LED work light lets you squeeze into tight places or work overhead without tiring. The kit comes with two 2.0Ah lithium-ion batteries that recharge in only 25 minutes, perfect for topping up on your lunch break. And each one has a built-in status indicator so you know when it’s time to refill them. When you compare the tools in the CT200RW kit with the ones in the XT273R kit described above, you’ll see that they are a close match. One factor that makes it easier to choose between them is that the XT273R tools have XPT protection against dust and moisture, while the ones in this kit do not. 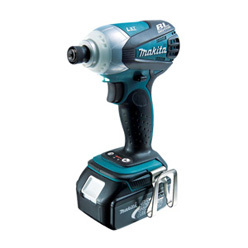 Or you might be swayed by the fact that Makita has officially discontinued both this drill and the driver. While both are still available from resellers, Makita doesn’t sell them anymore. But both the lithium-ion batteries and the rapid charger are still currently available. They happen to be the same ones included in the XT273R kit, too. Meanwhile, the XFD01Z ½-inch hammer drill offers a two-gear transmission with speeds up to 1500rpm. Its 4-pole motor puts out up to 480 inch-pounds of torque. That’s plenty for drilling everything from wood to masonry. And once you’ve sunk all the holes you need with the hammer drill, you can fasten the screws with the impact driver. This driver, like the one reviewed above, is very lightweight, compact, and powerful. Although it weighs only 2.8 pounds with the battery on board, it has 1420 inch-pounds of torque and speed up to 2300rpm. Both tools have built-in LED work lights to help you see what you’re doing, even in dim places. And their 2.0Ah batteries refill in 25 minutes on the included rapid charger so you don’t need to delay finishing your work for the day. 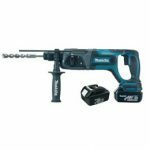 If you work where your cordless tools are going to be exposed to damp or dusty conditions, we recommend the Makita XT273R drill and driver kit with XPT protection. Otherwise, getting the CT200RW kit. 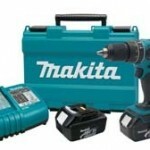 Click here to purchase Makita XT273R on Amazon.com! 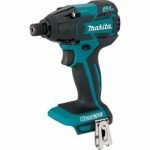 Click here to purchase Makita CT200RW on Amazon.com!